BOULDER, Colo. (AP); North America’s heaviest hailstone ever might also be its most-traveled. A 1-pound, 15-ounce hailstone that fell in Vivian, S.D., on July 23 has been taken to the National Center for Atmospheric Research in Boulder, Colo., about 370 miles away. This photo taken July 24, 2010 provided by the NOAA National Weather Service shows a hailstone that was found by a ranch hand in Vivian, S.D., on June 23, 2010. 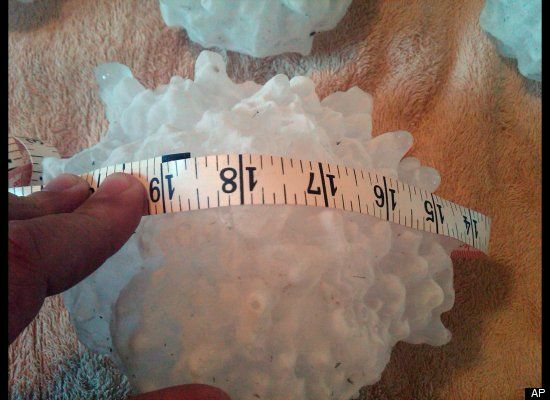 The hailstone has set U.S records. It measured 8 inches in diameter and weighed 1 pound, 15 ounces. 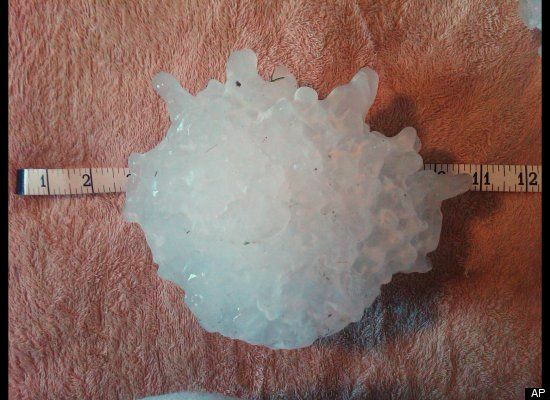 The previous record for diameter was 7 inches for a hailstone found in Aurora, Neb., in 2003. The previous record for weight was 1.67 pounds for a stone in Coffeyville, Kan., in 1970. (AP Photo/National Weather Service).